The Taylor Library subscribes to a number of print journals in the sciences and humanities, as well as publications of general interest such as the London Review of Books and the Times Literary Supplement. 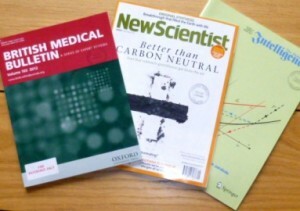 The most recent issues of journals are held in box files on the ground floor. If you are unable to find a particular issue, please ask a member of library staff for help. All journals are for reference only and cannot be taken out of the library. The full list of journal titles is given below.